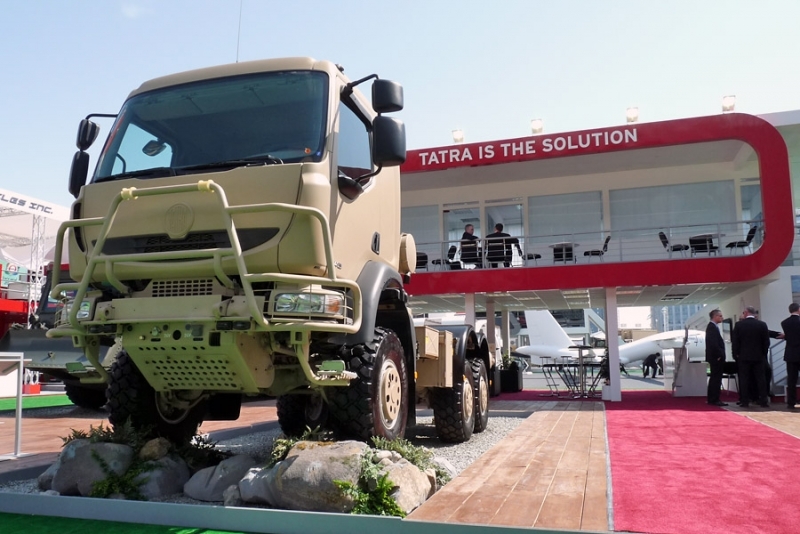 TATRA, a. s., the world's leading special off-road vehicle manufacturers is going to develop its positions in the GCC region and in the military business generally attending the world's prestigious defense industry exhibition IDEX 2013. 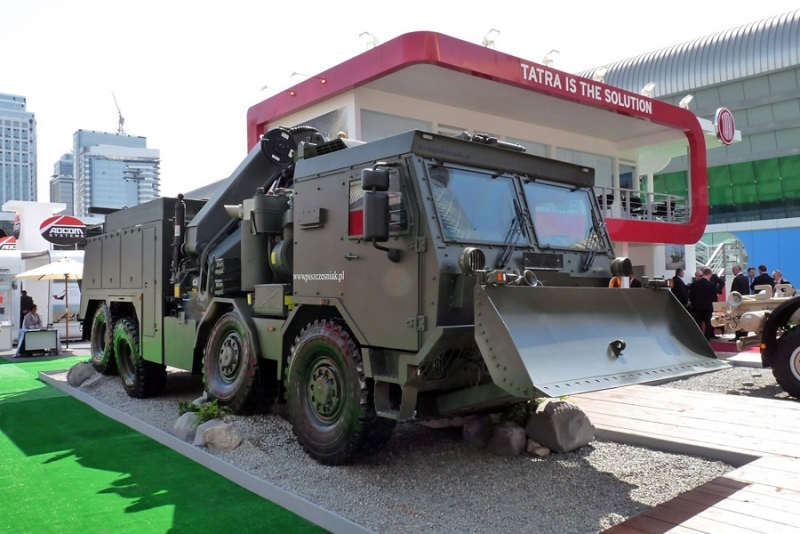 TATRA is represented by its daughter company TATRA EXPORT at outdoor stand CP-400. The first two mentioned trucks are based on all-wheel-drive TATRA 815-7 unique chassis with central backbone tube and independent half-axle suspension allowing heavy transport load and high speed in the most difficult terrain. 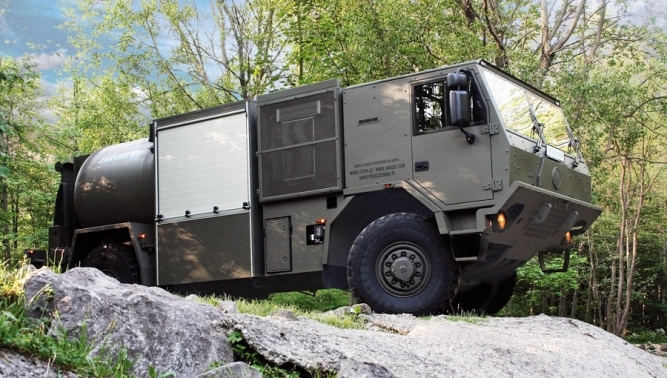 The third one is based on all-wheel-drive TATRA 810 chassis with rigid TATRA portal axles with amazing clearance, excellent for hard rugged terrain. The high mobility heavy duty (HMHD) recovery vehicle is able to recover most types of wheeled armored vehicles very quickly and efficiently in a tactical environment. Rear lifting fork enables to tow vehicles with front axle load up to 14,000 kgs and thanks to 44 tm Hiab crane is able to overturn crashed vehicles. The vehicle is able to make recoveries in extreme and hard environments. Front dozer blade is removable and it can be used for engineering works like digging of tranches, making roads and removing obstacles or barriers. Many other supporting systems and armored cab help the crew to work in demanding tactical operations. The high mobility heavy duty (HMHD) EOD vehicle is designed for transport of explosive materials up to 10 kg of TNT equivalent. It allows also safe transport of EOD operators with their equipment, including remotely controlled robots. The explosion containment vessel provides effective protection in case of uncontrolled detonation of transported unexploded ordnance (UXO) or other explosive material. Chassis' air springs on all wheels, along with the independent wheel suspension deliver low vertical vibration, provide high ride comfort and enable high speeds in rough terrain. 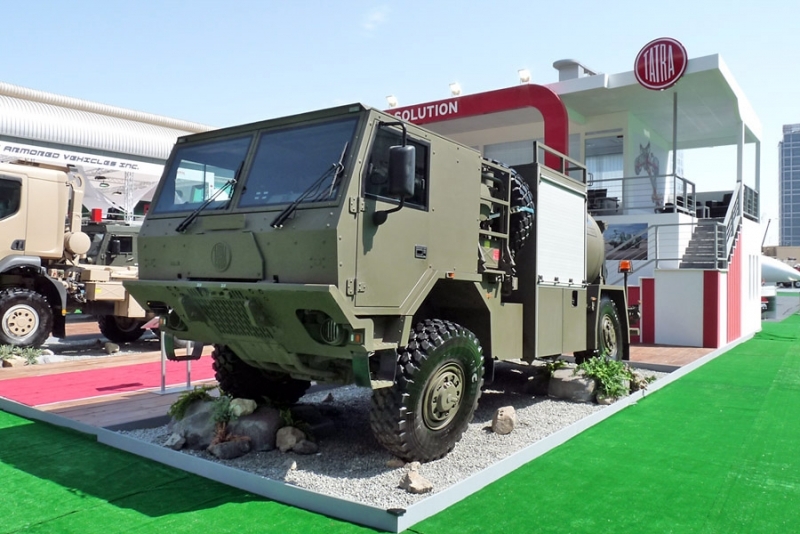 The third exhibit represents TATRA medium class of all-wheel-drive (6×6) off-road logistic trucks. It is designed to carry different superstructures up to 5.7 t of total payload. The hooklift platform is very popular to load different types of containers or flatracks with packed loads. Three-seat cab can be armored.